CrossRail Chicago is a vision to bring fast, frequent and reliable trains through Chicago and Cook County by upgrading existing tracks. CrossRail would create a north-south link that serves frequent commuter trains, airport express trains, and fast intercity trains from around the Midwest. It will require an unprecedented collaboration across agencies and jurisdictions, but it would offer the biggest return on investment of any transportation project in Chicago or the Midwest. Chicago is the hub of the Midwest. Despite having a dense railroad network woven deeply into its fabric and extending in every direction, Chicago can barely handle the current load of Amtrak intercity and Metra commuter trains. The region needs a high-capacity passenger line, free of interference from freight trains and highway crossings, to provide the convenient and reliable service that commuters and travelers demand. This would be a tremendous undertaking if built from scratch, but fortunately, most of it already exists under public ownership. Metra has two key lines that could be linked together and modernized to create such a trunk line: CrossRail Chicago. This passenger rail corridor would provide effortless travel, serving both high-speed intercity trains and frequent, all-day commuter trains. 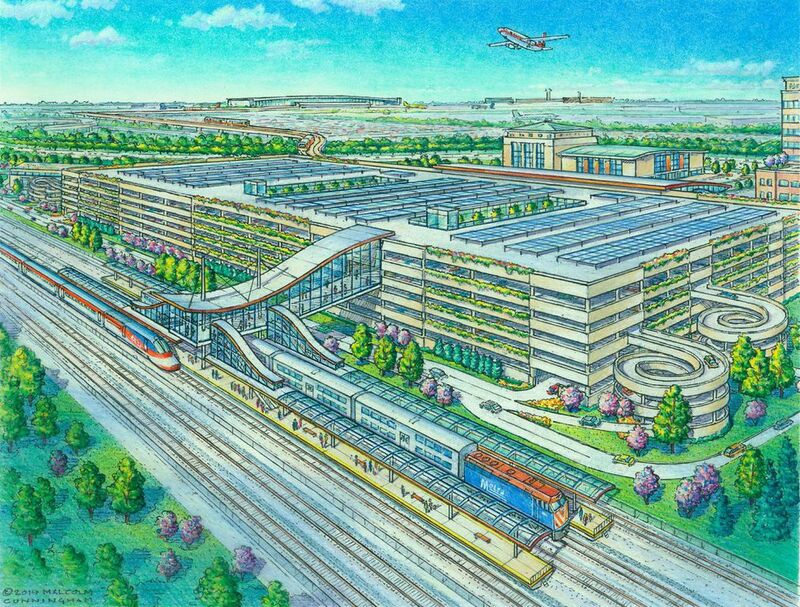 It would allow direct access to O'Hare, not only from downtown, but from the entire Midwest. It would become the core of metropolitan Chicago's transit system and the heart of a re-energized Midwest passenger rail network. CrossRail Chicago would be the highest impact transportation project in the Midwest, providing more passenger capacity than any other single piece of transportation infrastructure. It must be a priority for the Chicago region, and should be included in the region's ON TO 2050 plan. Tell Springfield that you want CrossRail to be part of the capital bill. 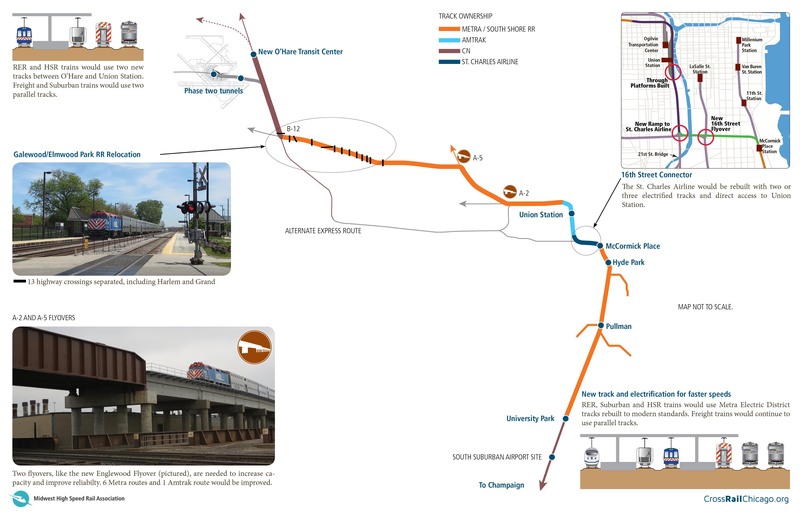 CrossRail Chicago connects the Metra Electric and the south side to Union Station, O'Hare and the northwest side. Click for larger. CrossRail is a once-in-a-lifetime opportunity to build a diverse, broad coalition for passenger rail investment. CrossRail takes what would otherwise be isolated constituencies and unites them around single program. At the same time that Chicago Mayor Rahm Emanuel advocates an express train from the Loop to O’Hare, a coalition is pushing for better transit on the city’s south side, and communities in northwest Indiana want new and expanded service. This could result in multiple multi-billion dollar ventures that compete for funds and fail to serve the region as a whole. The Midwest High Speed Rail Association proposes a unified, cross-jurisdictional planning effort that would unite these constituencies into a strong coalition that is capable of securing the necessary funds. The result would be a rail line allowing higher speeds and much more frequent service for a variety of trains. It would lower overall cost, yet have a greater benefit for the Chicago region and the Midwest. CrossRail Chicago would link together the Metra Electric Line and Metra’s Milwaukee District West and North Central Line. The program would consist of four major initiatives that eliminate bottlenecks and upgrade the entire route to modern standards with overhead electrification. It would separate passenger rail traffic from freight traffic, providing fast, seamless travel on clean, quiet electric trains. 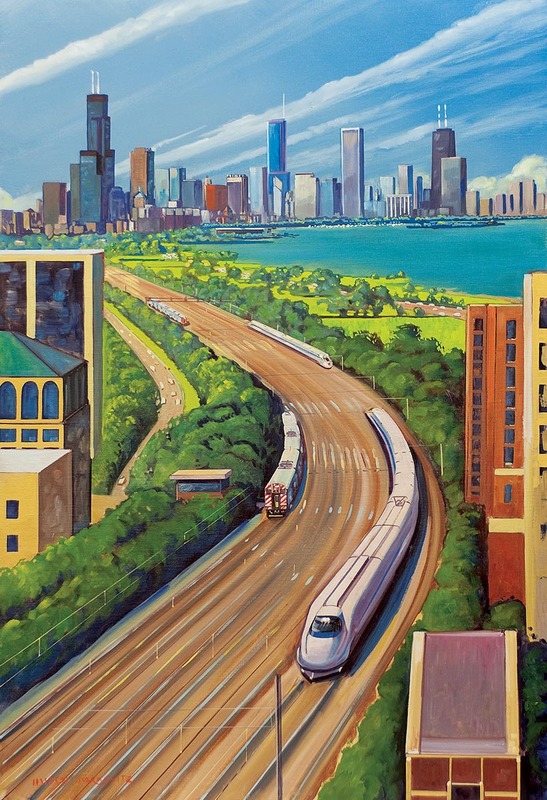 Building a high-capacity rail line through Chicago would be an enormous undertaking. Luckily, most of it already exists. 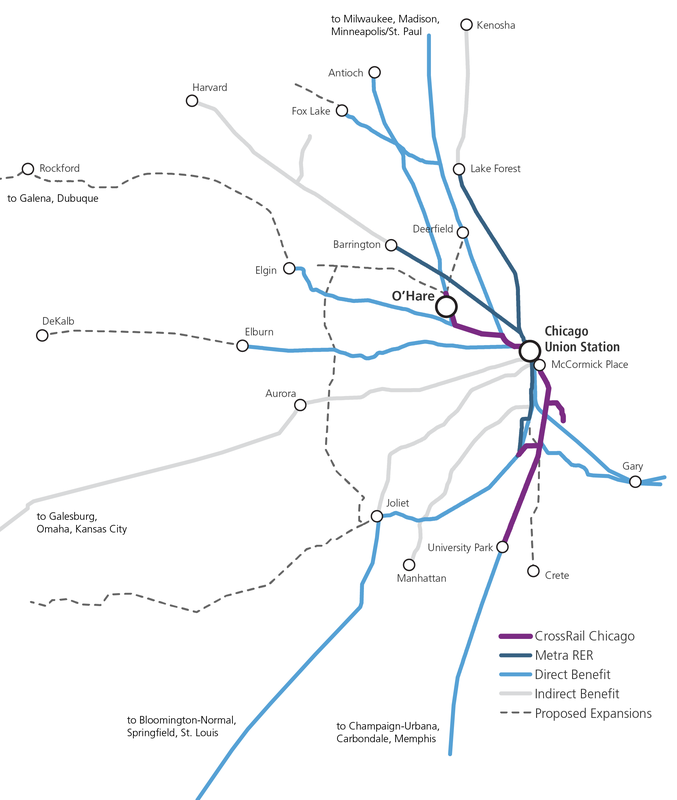 CrossRail would be the heart of a revitalized transit network for the Chicago region. Click for larger. Every day, more than a million people use public transit to get around the Chicago region. Many more could be avoiding traffic and saving money by taking transit, but the region's rail system was historically designed to bring people from the suburbs to downtown. Trips that continue through downtown, or go from suburb to suburb, are inconvenient or practically impossible on transit today. 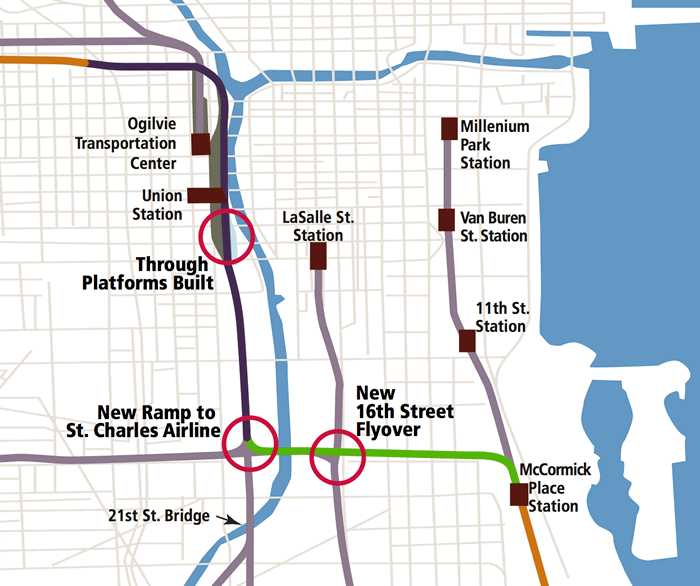 By linking two stub-end routes to create a continuous north-south corridor, CrossRail Chicago would create easy connections between parts of the region that seem isolated from each other today. CrossRail Chicago would allow trains to replace some express buses that CTA and Pace operate today. A single train can replace numerous buses, and offers a smoother ride that doesn't get stuck in traffic. These buses and resources could be re-deployed to improve neighborhood bus routes, including those that connect to CrossRail. 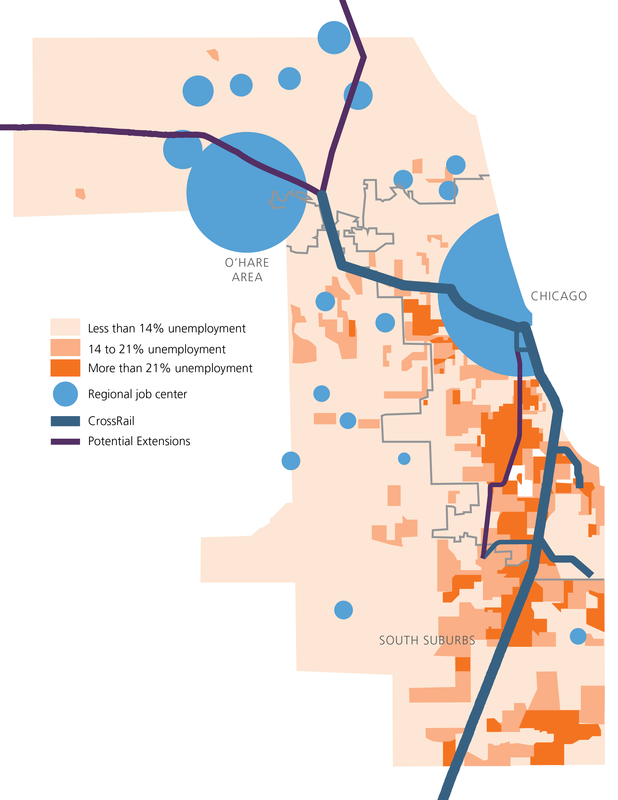 CrossRail Chicago would connect neighborhoods with high unemployment to major employment centers. Cook County has some of the best employers in the country, but workers are often unable to reach these jobs reliably or in a reasonable amount of time. For neighborhoods that struggle with high unemployment, access to transportation means access to opportunity. CrossRail Chicago would create affordable and convenient connections to the region's biggest employment centers. CrossRail Chicago parallels the Kennedy and Dan Ryan expressways, the Midwest's most congested highways. CrossRail's new connections and frequent service would be convenient and affordable alternatives to driving. For businesspeople and conventioneers, CrossRail creates a fast, one-seat ride between O'Hare, Union Station, and McCormick Place. It makes it easy to get to the University of Illinois at Chicago, the University of Chicago, and Chicago State University. It also lays the foundation for faster trains to the University of Illinois Urbana-Champaign. And, it gives visitors and locals alike easy access to Millennium Park, the Museum Campus, Soldier Field, the Museum of Science and Industry, the Obama Presidential Center, and the Pullman National Monument. CrossRail Chicago will be a modern, electric railroad that can serve many types of trains and every type of traveler, from everyday commuter to business and leisure travelers. CrossRail would let Metra use modern, electric trains that are faster, cheaper and cleaner. The tracks that form CrossRail already serve a number of Metra commuter train routes. CrossRail would allow for faster, more frequent service on these routes. 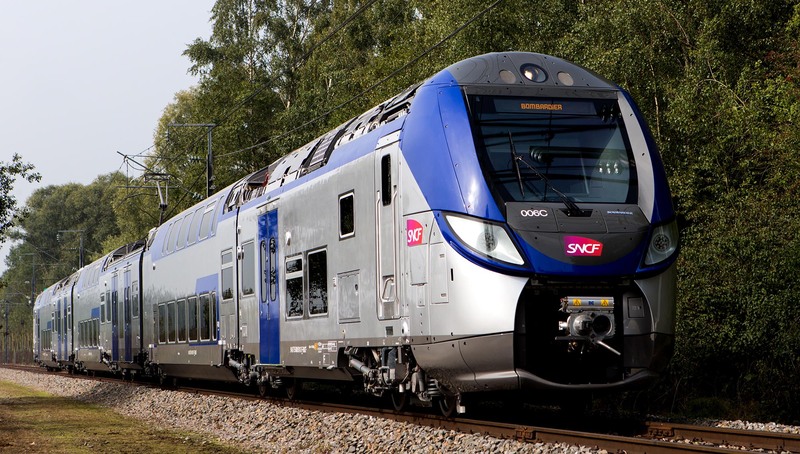 Cities around the world offer successful case studies in upgrading commuter rail networks to provide flexible, all-day service, often called regional express rail (RER). Today, Metra focuses on rush-hour commuters traveling between suburbs and downtown. CrossRail would let Metra serve many more people by offering frequent trains (every 10-15 minutes) throughout the day, like the CTA's rapid transit. 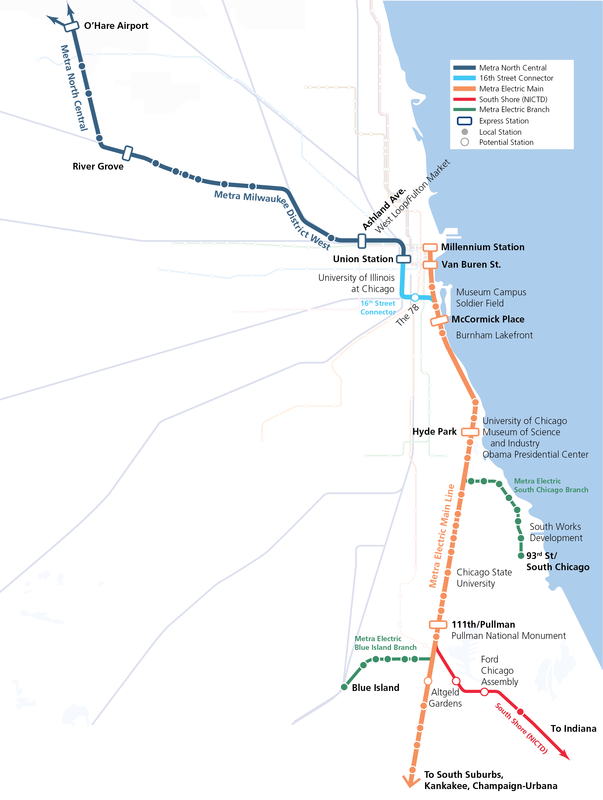 These trains would have fare integration and timed connections with CTA and Pace buses. The track upgrades CrossRail proposes would let Metra offer both all-stop local trains and limited-stop express service. Metra could also use modern, electric trains that accelerate and stop faster, are less expensive to operate, and are cleaner and quieter than heavy diesel trains. O’Hare International Airport is the Midwest’s connection to the world. It’s one of the world’s busiest airports, but not because it's one of the easiest to get to. CrossRail Chicago is a fast and cost-effective way to bring express trains to O'Hare because it takes advantage of existing infrastructure. Rather than being a single-purpose project, the upgrades necessary to create airport express service would also allow for improved Amtrak and Metra service throughout the region. O’Hare’s global peers boast train stations that serve all types of trains: not just local transit or subway trains, but also regional commuters and intercity expresses. Learn more about how CrossRail can make O’Hare globally competitive by offering this same easy access. Amtrak trains connect more than 50 Midwest cities to Chicago Union Station. CrossRail would improve the speed and reliability of Amtrak trains throughout the Midwest by moving them from slow, congested freight tracks to a dedicated, high-speed passenger line through Chicago. CrossRail would also let Amtrak trains stop at O’Hare, or be an easy cross-platform transfer away from an airport express train. This would immediately provide better travel options to hundreds of thousands of people. Most Midwest cities served by Amtrak have no air service at all. In others, Amtrak is more frequent than existing feeder flights. 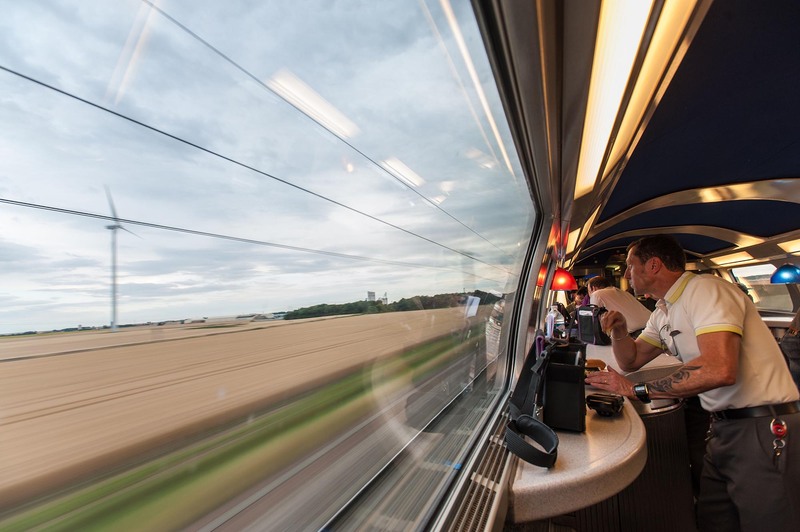 In any case, a fast, reliable train is more economical and comfortable than a "puddle jumper" connecting flight. CrossRail is the critical link that lets high-speed trains access the Chicago region, the hub of the Midwest network. New, dedicated high-speed lines will let trains travel across the Midwest landscape at 200 mph. These new high-speed lines then connect to existing, upgraded tracks—CrossRail—to finish their journey to downtown Chicago, O’Hare, or other points in the region. Today, most Midwest visitors to the Chicago area come by car, contributing to the region's crippling traffic congestion. However, 45% of these visitors are traveling from within a distance that would make high-speed rail a faster, more economical, and more comfortable way to travel. A Midwest high-speed rail network would bring an additional $13.8 billion in annual business activity to the Chicago region. 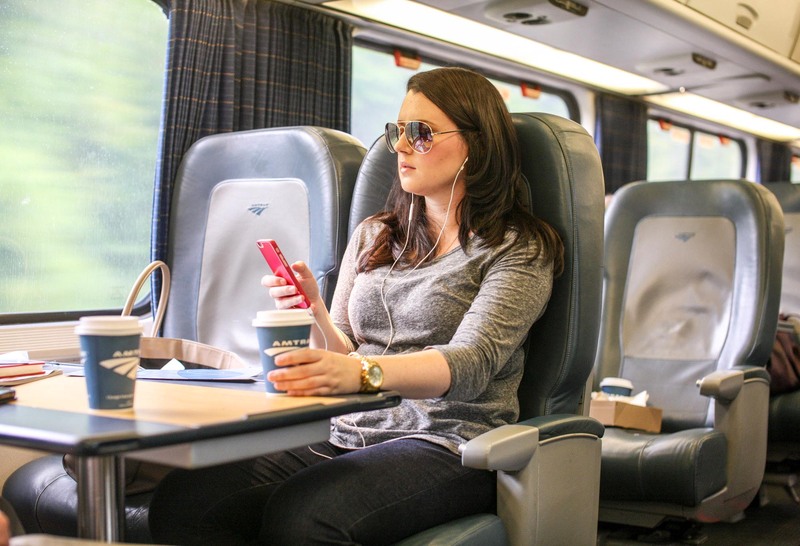 Learn more about why we need high-speed trains to reinvent travel in the Midwest. CrossRail would link existing rail lines with strategic upgrades. Click for full diagram. The Metra Electric District is a wide, elevated rail corridor extending 30 miles from the southern boundary of Cook County into Millennium Park Station east of the Loop. It is already electrified and completely separate from the freight network. When the line was built nearly 100 years ago by the Illinois Central Railroad, it was designed to host many types of trains, from all-stop commuter trains to non-stop express runs. Rebuilding this line to modern standards as part of Metra’s state of good repair mandate would create the capacity for the initial phase of high-speed rail while creating a new transit service for the city’s South Side. There is room for additional track as passenger volume grows. The Milwaukee District West Line runs northwest through the city starting from Union Station west of the Loop. Metra’s North Central trains branch off the West Line in Franklin Park. Dedicated passenger tracks could be built in the existing rights-of-way to create a high-volume link between downtown and O’Hare. In the process, several dangerous highway crossings would be separated. Rail flyovers at two key junctions would allow uninterrupted passenger operations. The 16th Street Connector uses existing rail lines to join the Metra Electric to Union Station. CrossRail’s biggest challenge is that Millennium Station, the end of the Metra Electric, and Union Station, the end of the Milwaukee West/North Central line, are one mile apart from each other across the Loop, the densest part of the city. Luckily, these two railroads can be joined via the St. Charles Air Line, an elevated rail right-of-way that provides the only east-west rail connection in downtown Chicago. The line spans about a mile of the South Loop parallel to 16th Street, connecting the south side of Union Station near the Chicago River to the Metra Electric along Lake Shore Drive. Rebuilding the St. Charles Air Line as the 16th Street Connector, with two or three electrified tracks and direct access to Union Station, would provide the essential link between north and south. It would not only link O’Hare with Union Station and McCormick Place, but connect the city’s south and north sides and allow service from Michigan, Indiana, and Ohio to continue through to Wisconsin and Minnesota. Old mail platforms at Union Station can be converted to serve passengers and allow trains to continue through the station. Chicago Union Station is the center of both the Midwest's rail network, and CrossRail Chicago's improvements. Today, Union Station is overcrowded and operating beyond its capacity. The station’s current stub-end design means all trains terminate there, but CrossRail relies on trains being able to continue through Union Station. Abandoned mail platforms under the old post office, immediately south of Union Station, can be converted into passenger platforms. These platforms are connected to the only tracks that pass through the station, next to the Chicago River. 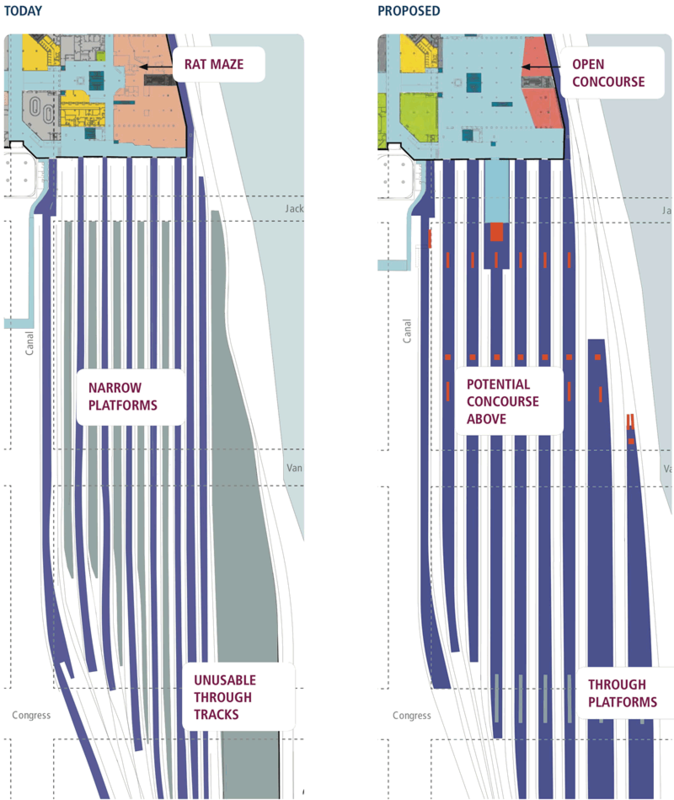 Learn more about what needs to happen at Chicago Union Station. Toronto resembles Chicago in many ways: a city on the water with many railroad lines radiating out from its core. In fact, a map of Toronto's commuter rail service looks a lot like a map of Chicago's Metra service turned on its side. But Toronto is doing something to set itself apart from Chicago and the rest of North America: it is upgrading and electrifying five of its busiest commuter rail lines to offer frequent, all-day service. Today's, Toronto's GO Transit trains operate much like Metra: trains are clustered around rush hour, with limited service during the middle of the day. When the upgrades are complete, Toronto's rush hour service will be twice as frequent and off-peak service will be four times as frequent, with trains as often as every 15 minutes. This convenience and flexibility will make the service so much more useful that annual ridership is expected to grow from 68.8 million (2016) to 127 million (2029). The total economic benefits are projected to provide a 3 to 1 return on the C$13.5 billion investment. GO Transit will use 4-car, bi-level electric multiple-unit (EMU) trains for off-peak service. Two or three of these EMU sets will be combined into one train to handle heavier demand during rush hour. Because EMUs are lighter than the locomotive-hauled coaches that Toronto (and Chicago) uses today, trains will accelerate and stop faster, reducing trip times and saving energy. The existing fleet of unpowered cars will also continue to be used as part of rush-hour service, but will be hauled by new electric locomotives. Metra could employ a similar strategy to provide more frequent service on its lines. Toronto also built a new spur off an existing line to create direct service to its airport, something Chicago should do as part of its plan to rebuild Terminal 2 at O'Hare. The service is operated with modern, comfortable diesel multiple-unit trains that will be converted to electric power once the infrastructure is in place. All these improvements required a dramatic expansion of Toronto's historic Union Station, which is already Canada's busiest passenger facility. (It sees twice as many passengers as Toronto's airport.) Like Chicago's Union Station, Toronto's was built in a beaux-arts style with a great hall and separate concourse. GO Transit is expanding its concourse by digging under they existing facility, which is something Chicago will also have to do to improve its Union Station. 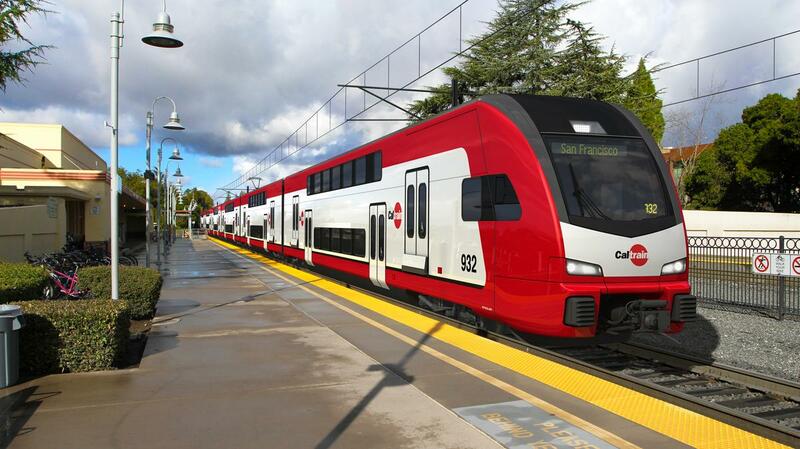 Caltrain's modernization will allow it to provide frequent, all-day service with lightweight electric trains that are faster and use less energy. Caltrain, the commuter rail line from San Francisco to San Jose, is underway on a modernization and electrification project. Like Toronto's program, Caltrain modernization is a direct example of how the Chicago region can upgrade existing tracks to provide better service. Not only will Caltrain's modernization let them run commuter trains as often as every 10 minutes, it will give high-speed trains from all around California a direct route into downtown San Francisco. Caltrain is the North American proving ground for the Phased Network Approach, making it the most important passenger rail project in the United States. Today, much of Caltrain's fleet is just like Metra's: heavy, bi-level gallery cars hauled by diesel locomotives. Electrifying the existing tracks will let Caltrain switch to lightweight, modern, electric multiple-unit trains that are faster and more efficient. Like Toronto, Caltrain's new fleet will supplement its current fleet of locomotive-hauled coaches, which will continue to be used to meet demand during rush hour. Denver has made a massive investment in its passenger rail network, including the all-new A-Line that connects downtown to the airport. The A-Line combines existing railroad right-of-way near downtown with a new route to the airport, including a station right inside the terminal. Trains run every 15 minutes and take 37 minutes to run the full length of the route. There are six intermediate stations that are popular with commuters. 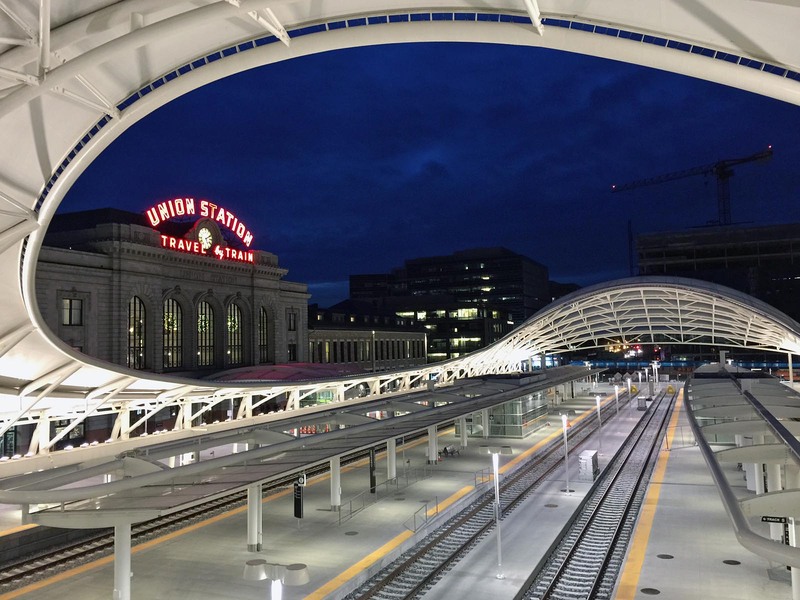 As part of the project, Denver restored its historic Union Station and built beautiful new platforms to accomodate the A-Line and other new service. The revived station anchors a revitalized and growing part of downtown. Help make CrossRail Chicago a reality by donating today! Receive a free bullet train key chain with each donation. Tell Springfield that you want high-speed trains in the capital bill.